I cannot believe it is only three days until I begin our annual advent activity tradition. I posted last year about the things we included in 2009, the first year we switched from candy to fun, you can find that post here. Last year I had planned to post our activities six days at a time as they happened but the month was just far too busy for blogging and I only posted the first six. 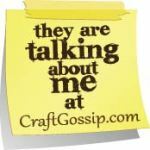 Instead of blogging them in January I saved it for a more timely post...now! I've had several requests for our list of activities. I'm still working on this year's list. Many of these will remain the same since in just two years they've become things the kids really look forward to. The slip of paper had to specify after dinner or the kids would've been asking for these as soon as breakfast was over. After they created their letters to Santa we drove to the mall to drop them in the large red mailbox Macy's has set up specifically to collect letters for Santa. The kids enjoy the large Santa mailbox and I like the fact Macy's donates a dollar for every letter to the Make a Wish Foundation. Princess Fierce wanted to be Jasmine for Halloween. She made up her mind in September and never wavered. I'm fairly confident the decision was based purely on the fact she wears a two piece outfit. I lucked out and found two complete blue and pink Jasmine costume including gold shoes at a local consignment store for under $30 for everything. She wore the pink outfit to see Disney on Ice: Dare to Dream with her cousin. An excellent show if you can still catch it in your town. For the show I tried to style her short, thin hair in the best imitation of Jasmine's hair I could manage. She loved the result. But for Halloween I'd made the offhand comment that I thought I could make her a Jasmine yarn wig. After Disney on Ice she told me she hoped I could make one but if I couldn't she'd be happy with her hair this way again. Such a sweet girl. I searched Pinterest and Google for inspiration but came up with only one other person making a yarn Jasmine wig. And she used a completely different method than I was comfortable with. I cannot crochet yarn into a highlighting cap. Nope. So I went my own way. I started with a pair of black girls tights from the clearance rack at Target. $1.50 for her wig cap. I put the waist around her hairline then tied a tight knot with the legs. Princess Fierce turned six in September. She's claimed the DragonCon Parade as her own personal birthday parade since it always happens the Saturday before her birthday. Once again this year we headed down to watch. She chose to not dress as Darth Fairy again but instead wore her Julie Newmar Catwoman costume. I'm not sure if it was the 25th anniversary of Dragon*Con, the 10th anniversary of the DC parade or the fabulous weather but this year the parade route was packed. I snapped this pic looking down Peachtree Street when we still had 45 minutes to wait until the parade started. The parade met the demands of the large crowd delivering the longest and best Dragon*Con parade yet. "Mom, will you cut my waffle/chicken/pizza/cinnamon roll...?" I hear this question often...and times three kids. I did not want to be cutting other people's food at the expense of my own hot meal for years and years. I had to end this. So at a young age I set out to teach my kids how to cut their own food. I must share these wonderful cookies with you. No picture can possibly capture their deliciousness. Fourteen days until Halloween! I have a snowman that countsdown to Christmas but nothing else. And my kids love to know exactly how many days are left until a special event. This year I created a chalkboard pumpkin to countdown the days until Halloween. Each day we wipe off the number and write the new one with chalk. After Halloween I'll change it to read Days Until Thanksgiving. Just start with a good sized pumpkin. This one had a rounded front shown here and a nice flattened back that worked perfect for the countdown. Apply a few coats of chalk board paint. And you're done. Huge added perk to this simple craftiness is the kids can use the chalk to create different Jack-o-Lantern faces on the other side. If you make no other Fall sweet treat with pumpkin, you need it to be this one. If you're not a baker you can still do this very simple three ingredient cake. I promise. You can even eat it without frosting. It's incredibly moist and delicious. The pumpkin flavor is subtle; it just tastes like you're eating Fall. Here's all you need for the cake: Betty Crocker Butter Pecan cake mix, canned pumpkin and three eggs. The cookies are entirely too simple, perfect for fall and completely adaptable to your tastes. They can be made with only a handful of ingredients...ingredients you very well may have lurking in your pantry right now. Great for Halloween or Thanksgiving get-togethers or just for this afternoon. All you need is cake mix, canned pumpkin (not pumpkin pie filling), chocolate chips, cinnamon, nutmeg and ginger. I'm a big fan of Betty Crocker cake mixes. I always stock up when they're on sale. This is another creation credited to Pinterest. I'd seen a snake wreath pop up there a month ago, a snake wreath created by none other than Martha Stewart. I had to make the wreath with my family's snake history including the copperhead that bit our dog last year and the rat snake somehow discovered in my son's room; we needed a snake wreath for Halloween. I found a plethora of rubber snakes at the Dollar Tree and dollar spot section at Target. I also needed a wreath. I wanted a large grapevine wreath and I found this one on half price day at my favorite thrift store. I saw this idea on Pinterest from a blog in Thailand. I knew I wanted to make it with my kids. You'll need an empty plastic bottle, preferably a smooth one. Mine is a Smartwater bottle. A clear plastic bag. In the Thai blog, she used a clear shopping bag but I don't have a single store near me that uses clear shopping bags. They're all white or yellow. However, the thinner produce bags are clear so I used one of those and hoped it would work. Once upon a time I hated American Girl Dolls. This time was very, very recent. And truth is I still dislike their massive commercial nature. We have an American Doll Store in my town and it is insane to walk in there. I'd hoped to keep Princess Fierce away from them forever but she was lured in a few months ago. Fortunately she has her momma's thrifty streak and even at five could not fathom the need for a $100 dollar doll when a very similar one was available at Tuesday Morning for less than $20. And the Tuesday Morning doll, from the Target line, looks like her. She scored that bargain doll for her birthday. Here she is with it the very weekend after her birthday taking Remember on a hike to see waterfalls. But do you see the back of Remember's ponytail? That's a plastic hair rat nest and the doll is only days old. Uh-oh. Princess Fierce was not happy with how fast her hair was tangling. A quick turn to the Interwebs and I found a solution. A wig brush and a mist of water. Whatever you do don't dare touch their tresses with the plastic toy brushes sold with the dolls. We headed off to our local Sally's Beauty Supply to score an inexpensive wig brush. Only $3.99. A quick mist with water and strokes of the right brush and Remember's hair was smooth and ready for a braid. But this post is not about how to brush a doll's hair. Nope, this is about a bigger problem. My own daughter's hair. This is what I'm dealing with when Princess Fierce wakes up. And guess what? She HATES me brushing her hair. She also hates brushing it herself. She also is not a fan of headbands or barrettes and will tolerate a pony tail on rare occasions. Rare! So this means daily we battle over just trying to brush her hair. Regarding style, it just hangs free and wild...like her spirit. I will even confess some days I don't have the fight in me so we just skip brushing and this is her hair for the entire day. Bad mommy! My oldest son loves Harry Potter. This is him decked out in his Quidditch robe at Dragon*Con last year. He's loved Harry since he was barely two years old. His early affection can be blamed on HBO's constant running of The Sorcerer's Stone. It captivated him. We took him to see The Chamber of Secrets in the theater and it may very well have been his first movie theater experience. When Hagrid returns to the dining room cheers in the final scene my little boy stood up and cried because he knew the movie was ending. Fast forward five years when Thing One is 8 years old he began reading the Harry Potter books. He had never seen any movies beyond those first two in all the years between. When he began the books his Harry Pottter love was reborn with an unquenching thirst. He voraciously read the books from the library. And soon wanted to own them all. Here he is with one of his favorite birthday presents on his ninth birthday, the remaining six books he could keep. Once he had completed reading the series we rented the Prisoner of Azkabam through the Half-Blood Prince for him to watch. He already knew disappointment from a book converted to film but was satisfied with the adaptation of Harry Potter. The second Harry Potter Thing One ever saw in a movie theater was the first he actually remembers: The Deathly Hallows, Part One. He was over joyed and immediately a year long conversation began about seeing the final film. And during this year his Harry Potter love manifested in new ways. His closet shrine for instance. With a shelf dedicated to all thing Harry Potter. His painted pumpkin for last Halloween was an homage to Harry Potter. His Halloween costume last year even came with a request to cut his shaggy locks shorter and spray his hair dark. And more recently our Museum of Natural History hosted a Wizards and Witches Weekend and he committed again to a costume as a Hogwarts student. So as the date grew close for the end of Harry Potter in cinema we discussed the idea of a Harry Potter viewing party complete with Harry Potter snacks. I made a grave error in this discussion forgetting each film is approximately two and a half hours long. No one would come to a party to watch over 21 hours of videos. Oy! How would I tell my dear boy his party could not happen? Then I had another idea I pitched first to my man. A Wizarding Week of Harry Potter! We'd determine what day his father would be taking him to see the new movie then count back seven days and show one movie and serve one themed snack per day. My man was on board and I presented it to Thing One. He was sold! My friend next door planned an egg hunt Saturday for the neighborhood kids. I offered to bring cupcakes for everyone. My initial plan was to create cupakes with bunny bums on them. I had flattened over 50 mini marshmallows with the idea to color them into bunny feet. My friend next door made a cute and simple Peep chick wreath the other weekend. I had to follow suit and make one too. I chose the Peep bunnies just to be less of a copy cat. This wreath cost less than $7 to make. Shazzam! This year I tried out silk dyed eggs. I saw this technique last year after I had already dyed marbelized eggs. Drats! But then again maybe waiting a year was worth it. I'll definitely be doing this process again. 100% silk ties, scarves, shirts, etc. My kids and I set off to the thrift stores in late March in search of silk ties. I let the kids pick whatever tickled their fancy as long as it had a 100% silk label and was $1 or less. Here's our bounty of ties. Today I have to share a most excellent birthday party I had nothing to do with. I just begged my friend to let me take pictures and blog about all her creativity. Meet Cooper. He's the birthday boy and very lucky son of a dear friend of mine. A friend that predates training bras and mall bangs. 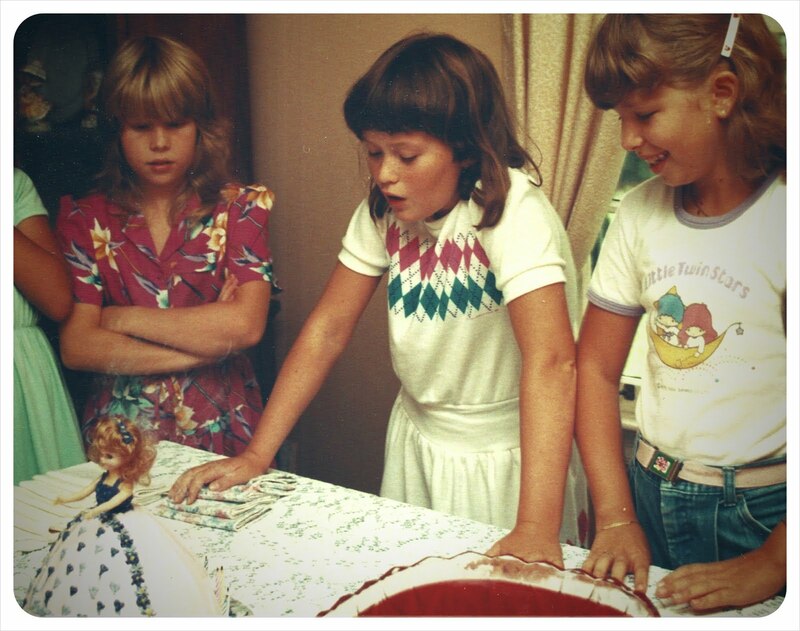 I'm the 1984 birthday girl in the center and Cooper's mom, let's call her Ophelia, is the one on my left in the awesome My Little Twin Stars tee. If her shirt choice isn't proof that Ophelia's super cool maybe this will convince you.